Exceptional in quality, this hand colored French Fashion Lithograph is precious, the colors lush and deep. 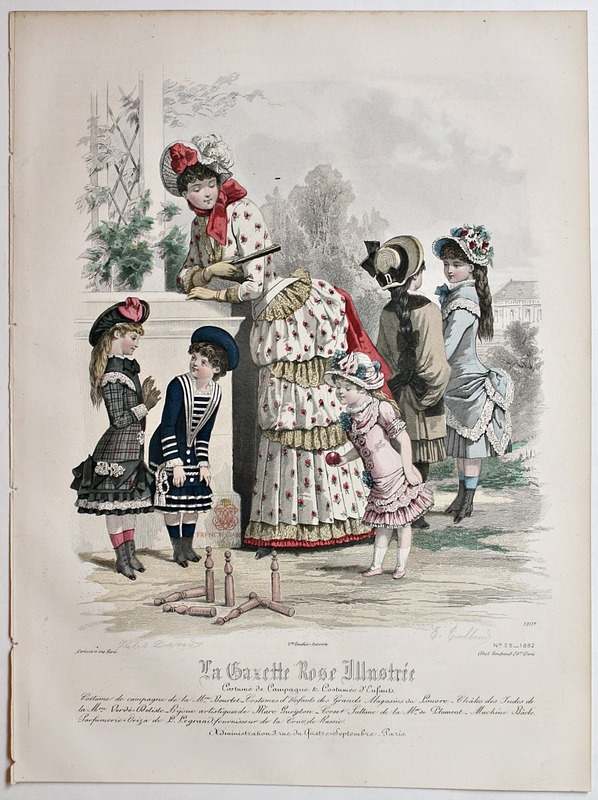 From disbound copies of La Gazette Rose Illustree, Paris, 1882, a celebrated Parisian fashion publication used by seamstresses to copy the latest in dress trends for their luxury clientele around the world. Bought in Paris. Signed by Jules David, a French painter and lithographer, who introduced naturalistic situations to fashion illustration. Colored with bright water colors, this print shows a group of young girls, each wearing a different beautiful dress, pink silk, light blue with lace, a brown ensemble, a darling blue sailor dress, and a Scottish plaid dress with a tam. The detail is gorgeous, their elegant sister looks fetching in her rose print gown, plumed hat and gloves, she holds a fan. The girls are playing the French game of quilles, nine pins. Each is an original work of art. To be expected in prints of this age, there may be a few characteristic areas of foxing etc., this print is in beautiful antique condition. Perfect to frame, loves the company of others. Display in a grouping, these feminine prints make a stunning statement! Measures 14-1/4" x 10-1/2".